Cambridge, Mass – As I wrote in my previous post, I feel like we have tested out every kids’ Spanish program in the metro Boston area, in attempt to get/keep the twins speaking Spanish. 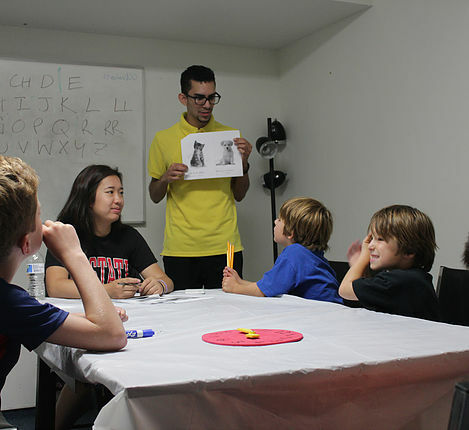 This summer, we decided to try one more: Rola Language Institute. When I wrote to inquire about the program, the director sent me a sample schedule, which included reading, music, grammar, verb practice, conversation and vocabulary, as well as outdoor time and games. When I contacted other parents to learn about their experiences with the program, they said Rola was “very strict” about not allowing the kids to speak English at the camp. Most of the twins’ other Spanish classes have left me wondering about their academic rigor. Suddenly, I found myself wondering if this wasn’t too rigorous…? 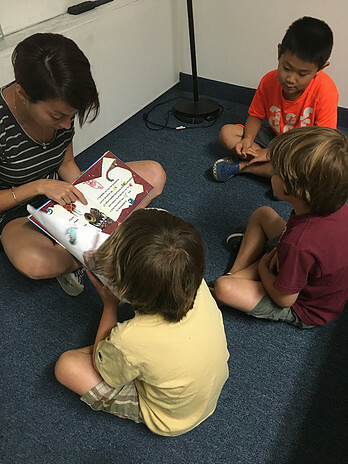 But the director assured me that he had many years experience with making language learning fun for kids, including those at the most introductory levels. So I decided to give it a go. I was put off on the first day, when their instructor introduced herself in English. Then at pick-up, I discovered all the kids watching a movie (in Spanish, at least). The teacher implied they were watching a movie because it was raining, so they couldn’t go outside. Yet the kids were watching movies every day when I arrived for pick-up, even on sunny days. (In case you are wondering, this was not on the schedule that I was provided.) When I asked about what they learned, the twins showed off their counting skills. (For the record, they knew how to count in Spanish before the Rola camp started.) Did you play any games? No. Did you read any books? No. Did you sing any songs? Yes, but I don’t remember it. I couldn’t help but wonder if this program was an utter waste of time and money. And yet, the twins seemed to be enjoying it. During the second week, the twins had a different instructor, who spoke Spanish whenever I saw her. This was a step in the right direction. And, they seemed to really like her. Even better. But I was still skeptical. Me: Did you play the game in Spanish? V: No, we just said ‘Uno’ in Spanish. Really? Now I was starting to doubt my source. The instructor assured me that they said all of the words in Spanish — colors, numbers, everything. That’s reassuring. On another day, V informed me that he learned a new word: Burro, which was the name of another game. Me: Oh, did you play a new game? V: No, I was busy doing something else. But I learned what “burro” means. And most importantly, perhaps, they did not put up an ounce of resistance to attending Spanish camp. Not ever. They liked it. Me: When it’s time to go back to school, do you guys want to do an after-school Spanish class with [instructor]? V: Mmm, I’ll think about it.